Good morning! I was just starting my Sparking this beautiful morning and saw on my Goal Motivator that I entered "Weighed 199.6 on 6-8-15". Sad thing is I am still bouncing from 199ish to 204! Why do I do this? Why do any of us do this? Hoping to figure me out one of these days. Hoping you have a Happy and safe Independence Day celebration!! God Bless America! Keep on keeping on.... refuse to give up on yourself! Happy Independence Day to you too! That is not a big weight difference. I bounce around a lot too! Happy 4th and best on your health journey. Just keep checking in here. You will find your answers if you keep looking. 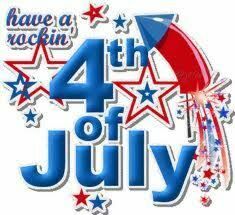 And have a great Fourth !! !